What’s Courtney’s approval rating during the first season of The Mayor TV show on ABC? 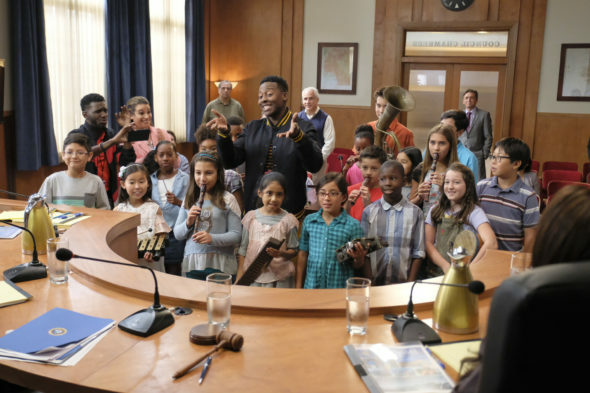 As we all know, the Nielsen ratings typically play a big role in determining whether a TV show like The Mayor is cancelled or renewed for season two. Unfortunately, most of us do not live in Nielsen households. Because many viewers feel frustration when their viewing habits and opinions aren’t considered, we’d like to offer you the chance to rate all The Mayor season one episodes here. Note: The final four episodes were released on Hulu and did not air on ABC. An ABC sitcom, The Mayor stars Brandon Micheal Hall, Lea Michele, Bernard David Jones, Marcel Spears, Yvette Nicole Brown, and David Spade. After years of drudgery, hip-hop artist Courtney Rose (Hall) decides he needs a publicity stunt to create some buzz around his fledgling music career. To that end, he runs for mayor of his hometown of Fort Grey, California and scores a surprise win. While Courtney’s intelligence and creativity lend themselves well to his new position, this is his first full-time occupation, so he needs a little help growing into the role. Fortunately, he gets it from his mom, Dina (Brown), friends TK (Spears) and Jermaine (Jones), and Chief of Staff, Valentina Barella (Michele). What do you think? Which season one episodes of The Mayor TV series do you rate as wonderful, terrible, or somewhere between? Should ABC cancel or renew The Mayor for a second season? Don’t forget to vote, and share your thoughts, below. More about: The Mayor, The Mayor: canceled or renewed?